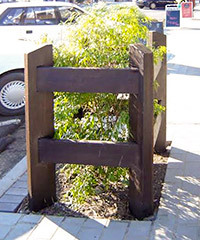 The tree surrounds are manufactured from hardwood using species suitable for the application. Care is taken to ensure that the portion above ground is graded to give an attractive appearance. The edges have a 6mm radius to reduce the likelihood of splinters. 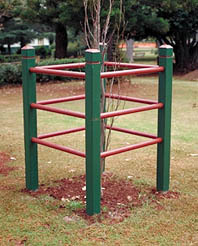 Bollards from Outdoor Structures Australia’s Park range can be easily adapted to serve as tree surrounds but the ones most frequently chosen for this are the ‘Heritage’ and the ‘Heavy Duty’ series. These surrounds are manufactured from hardwood using species suitable for the application. Care is taken to ensure that the portion above ground is graded to give an attractive appearance. The edges have a 6mm radius to reduce the likelihood of splinters. Outdoor Structures Australia has the flexibility needed to produce similar products but to your own design. Decorative face routing on the posts is also available.